Millennial women seek out memorable experiences to help them find their happy. Very often, these experiences include attending cultural events in person. 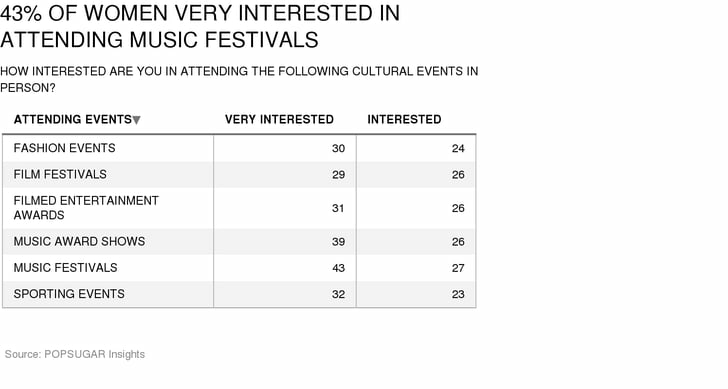 As part of the POPSUGAR Insights Content, Culture, and Commerce study, we surveyed over 1,500 women between the ages of 18-44 and asked them how interested they are in attending the following types of cultural events in person. Overall, 70% of women are very interested/interested in attending music festivals, like Coachella or Lollapalooza, in person. Music award shows, like the Grammys, ranked second overall with 65% of women saying they are very interested/interested in attending in person. After music events, women are interested in attending filmed entertainment award shows (57%), major sporting events (55%), film festivals (55%), and fashion events (54%).